Juniors Printed Knee Pad - Set of 2 | Multicolour | Makes crawling more comfortable for your little one. Save SAR 7 (21.88%) – Earn 2 Shukrans What is Shukran? Shukran is the Landmark Group’s award-winning loyalty programme in the Middle East, which allows you to earn Shukrans when you shop any of our brands. 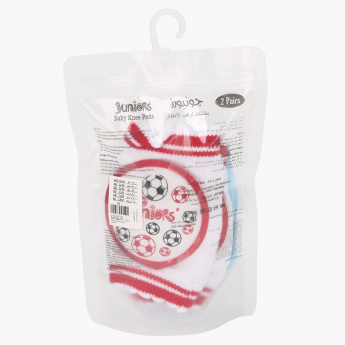 Keep your little one's knees free from bruises and dirt using these knee pads. The set comes with two pairs that have a lovely print and are comfortable to wear. Feature 2 : Flexible:able to follow the shape of knee. Feature 1 : Makes crawling more comfortable for your little one. Feature 3 : Allow ventillation around the knee, no discomfort.